If you have spent much time here at Cooking With Carlee, you know that I love to cook with my little guy. One of our favorite things to make is baked oatmeal. He begs to make it sometimes, and who am I to say no to such a wholesome treat? He gets so excited to create something tasty with me. He has egg cracking, ingredient dumping and stirring down to a science. He even gathers up some of the materials he knows we will need to make it. First he carries his table and chairs into the kitchen, then he gets out the whisk and his pick of bowls. Then we are ready to go to work! The only kind of baked oatmeal I had tried in the past were dense and chewy. I actually really like a texture like that in my oatmeal, so I was plenty happy. Then we started experimenting with adding a good amount of yogurt to our recipes. The resulting texture is so much softer and almost fluffy. That is our new favorite way to eat our baked oatmeal. This was a great way to use some overripe bananas. Hey- not every ripe banana can be made into Di's banana cake (though it certainly wouldn't be a tragedy if they all were!) The results were a hit and this pan didn't even make it through the day! In a mixing bowl slightly mash the bananas (some lumps are fine.) Mix in eggs until well incorporated. Stir in remaining ingredients until they are evenly mixed. Bake for about 45 minutes or until the center is set. Serve warm or at room temperature. Drizzle with more maple syrup if desired. My grandson helping in the kitchen warms my heart on this dark cold morning even more than that oatmeal would. Look at those wholesome ingredients. Yum! He is such a good helper. I am sure we'll have to whip up some new oatmeal soon! I love seeing your little helper in the kitchen! Isn't he cute with his whisk and cracking the eggs? I'll bet this new version of baked oatmeal is so tasty! He is the best little helper around! We have been having the best time making new versions of oatmeal. The best part is he loves to eat it too. Carlee, this sounds so good! 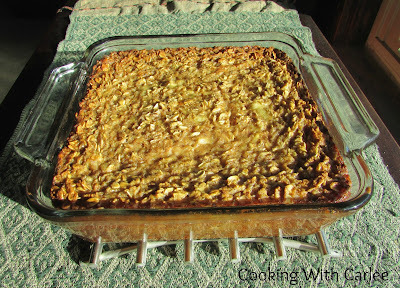 I haven't ever seen a recipe for baked oatmeal that wasn't sweet and full of all kinds of sugar! I'm going to try this! Bye bye banana bread!! We love our baked oatmeal! If you use the sweetness of the bananas to your favor, you don't have to add a ton of processed sugar. This sounds delicious! I love that it uses bananas and maple syrup for the sweetness - what a perfect breakfast treat! Or morning snack :) I might even smear it with a little peanut butter and have it for an afternoon pick-me-up. YUM! Oh yummy! I love peanut butter, so I don't know why I didn't think of that. Now I need to make another batch! Wishing you and your family a bountiful Thanksgiving and thanks so much for sharing with Full Plate Thursday. Thanks, Miz Helen and the same to you! Wow this looks so delicious and healthy too. I think this would make a nice breakfast or dessert dish! Thanks for sharing this at Cookin gand Crafting with J & J. It would make a very healthy dessert! We just loved baked oatmeal. Have a great Thanksgiving! This sounds so tasty! I've pinned it! 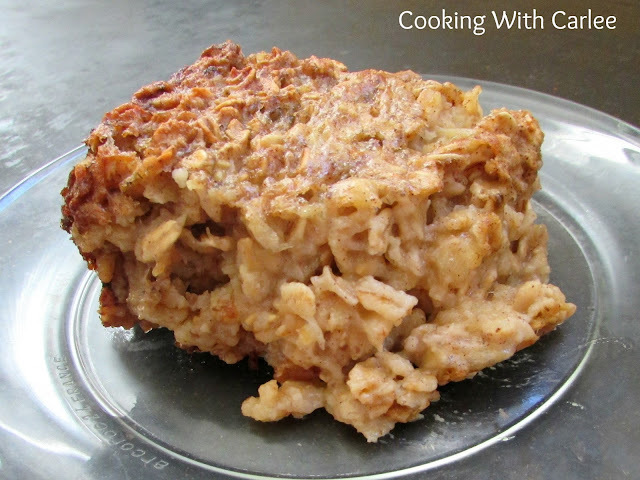 Hi, Carlee ~ I've never had baked oatmeal, but it look delicious! I'm pinning this recipe so that I can give it a try. Thanks for sharing with us a the Merry Monday Link Party! Hope to see you again on Sunday night! We really love our baked oatmeal. I hope you love it too! See you Sunday! What a yummy breakfast treat! And you little one is adorable! Thanks for sharing on My 2 Favorite Things on Thursday! Hope to see you again this week (Dec. 3rd)!! Pinned! Thank you so much, we have a lot of fun together! Thanks for hosting too!